Chief Instructor Sifu Brian Batemen has been studying martial arts for over 30 years with many of the great masters of our time, and is an 8th generation disciple of the Seven Star Praying Mantis Style. Sifu began studying Shaolin Kung Fu under Lau Kwai Ming, studying Hung and Jow Car, as well as lion dance. Then in 1990, he began studying the Praying Mantis Style of Kung Fu under Grandmaster Raymond Fogg. After training in the style for more than a decade, Sifu Bateman was certified to represent and proliferate the Mantis Style by Grandmaster Fogg and the United States Kung Fu Exchange Federation in 2003. He then went on to further his studies in the Praying Mantis System under Grandmaster Lee Kam Wing, head of the Lee Kam Wing International Martial Arts Association. In 2006, Sifu Bateman had the great honor of becoming a closed door disciple of his master, Grandmaster Lee Kam Wing. At such time he made a lifelong commitment to his master and his teachings to promote and teach the 7 Star Praying Mantis System as taught by his Master. He was passed down the hand written manuscripts of the style, and is the first to interpret these manuscripts into English and share his knowledge gained with his students. 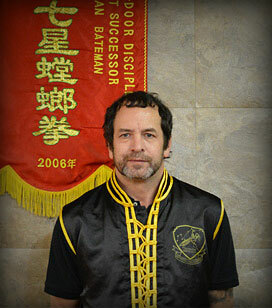 In 2010 Sifu Bateman achieved the rank of 10th Dan and Chief Instructor. Sifu Bateman currently sits on the executive board of the The World of Traditional Seven Star Mantis Style Federation. Rochester Shaolin adheres to the traditional methods passed down from Lo Kwan Yu to Chiu Chi Man to Grandmaster Lee Kam Wing. Sifu Bateman is one of only a few 8th Generation successors to the style, and the only 8th generation disciple in Upstate NY. All rankings received at the school are internationally recognized by the Lee Kam Wing International Martial Arts Association.